I fully intended to take photographs but it slipped my mind. The conference in Indianapolis was lots of fun. My classes went well. The meeting was in a lovely area of town. The students were great. I hope Charlotte turns out as well. When I got home, I had lots of lessons waiting. After a day or two I was completely caught up. I will be gone from August 1-9 on a road trip so no blog or salon next week. It is always nice putting a face to a name. Quite a few of my students were at the conference. Someone will be picking up my mail while I am out of town. I just won't be getting them back with lightning speed. I will be able to send out new orders. There will not be another tip until August 16th. Many of the new tips will be ones that came up while I was teaching in Indianapolis. This week will be the last tip on picking up stitches. This is very fresh in my mind as I taught finishing at Indianapolis. 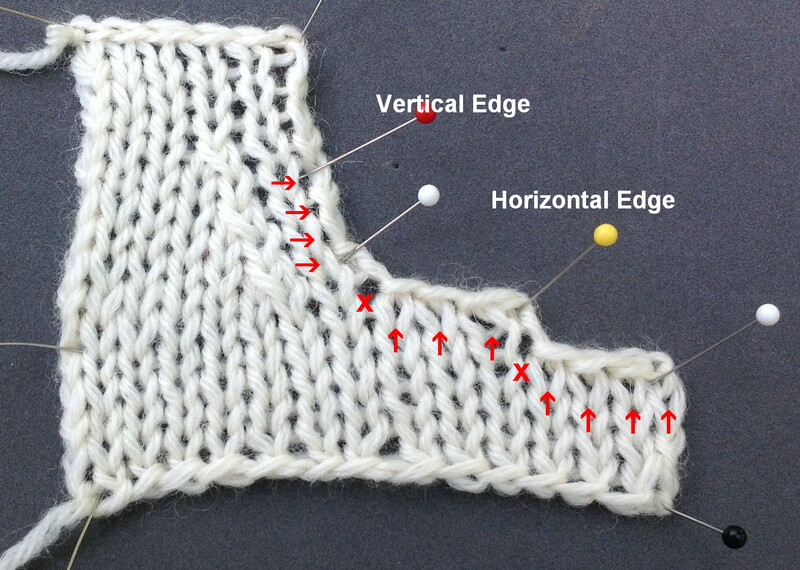 In previous weeks I have touched on picking up stitches on horizontal edges (bind off edges) and vertical edges (selvedges). A curved edge is a combination of both types of edges. Often decreases are made on the horizontal edge to enhance the curve. Curved edges are most frequently at necklines which is unfortunate since so many knitters more or less fudge picking up stitches on necklines. Since a neckline is close to the face, you see it every time you look in a mirror so mistakes really stick out. If you mess up a side seam you can always compensate under the arm which is easily hidden but holes between the body of the neck and the band are pretty obvious. 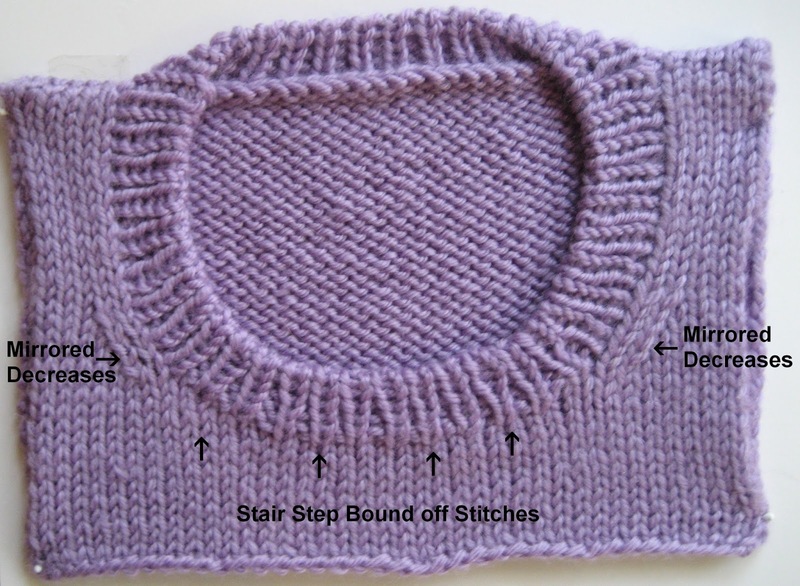 As with stair step seams, the problem is the where the bind off rows meet and the transition from horizontal edge to the vertical edge. All of these locations have a space between the column of stitches and it is the natural tendency to put a stitch in the hole. All that does in make the hole bigger and stretch out the neckline. This photo shows a band picked up properly. Notice there are no holes or gaps. When you do a band in a different color, it can look a little strange. 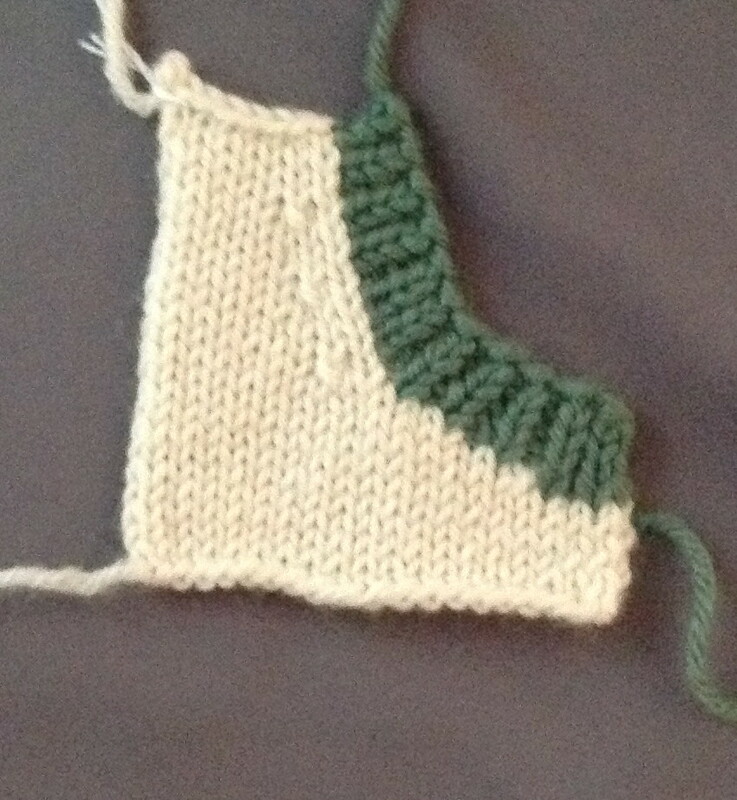 I used a different color to more clearly show where the stitches are picked up. 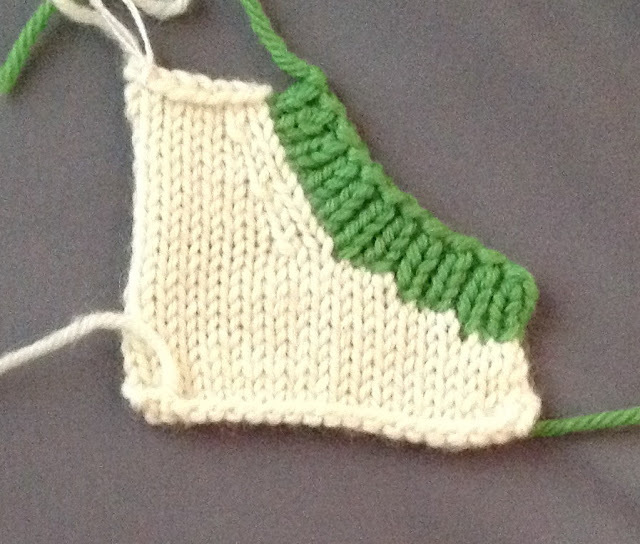 In this photograph, the stitches are picked up with the same color. 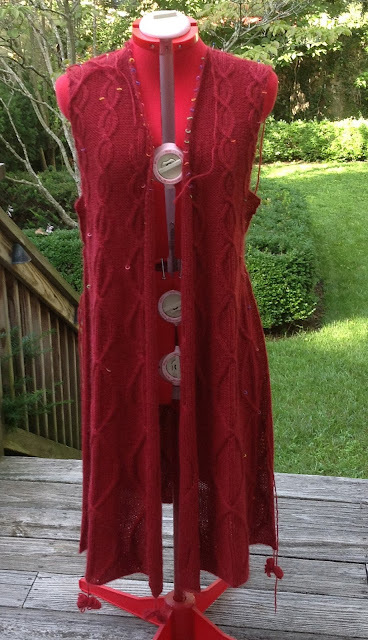 It is a better demonstration of what the neckline should look like. This photograph shows where NOT to pickup stitches. Notice that there are holes where the stitches have been picked up BETWEEN columns of stitches. Salon this week will be on Saturday from 1:30-3:20. There will not be a salon next week or maybe the week after. It depends on how quickly I can bounce back from my road trip. I didn't get that much time to knit in Indianapolis. DUH! I taught 18 hours, not including Masters Day and there were functions at night. I basically went to bed earlier than I have in years. This was a bit problematic as the Caduceus coat was due this week. OOOPS! Good thing I am going to the photo shoot so I can bring it. I should have it finished by early next week. I'm on the sleeves now which will take no time at all. 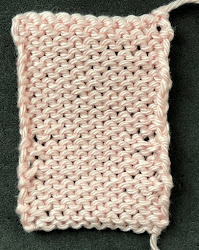 I do have to pick up the front bands but I am using Size 8 needles. The fronts are blocked. Disregard the dental elastics. I will remember to take them out. The coat is designed to fit Penny Sitler, the Executive Director of TKGA. She likes to wear garments from the magazine when she is at shows. Penny is tall and it is designed to come to her knees. I did buy a few things at the market in Indianapolis... I was going around making everyone touch the yarn I bought. 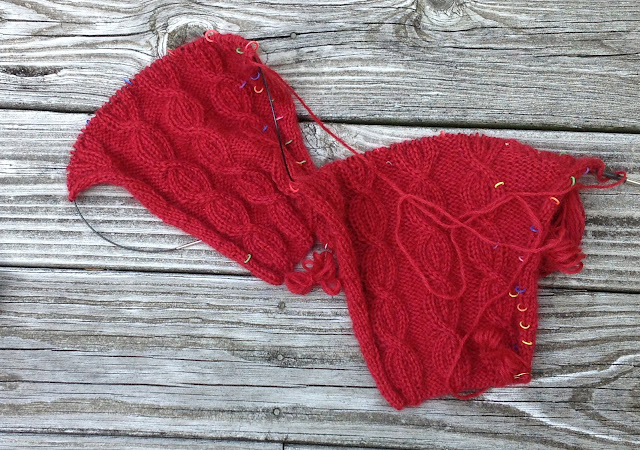 (A knitting conference is the one place you can do that and not sound like a pervert.!) 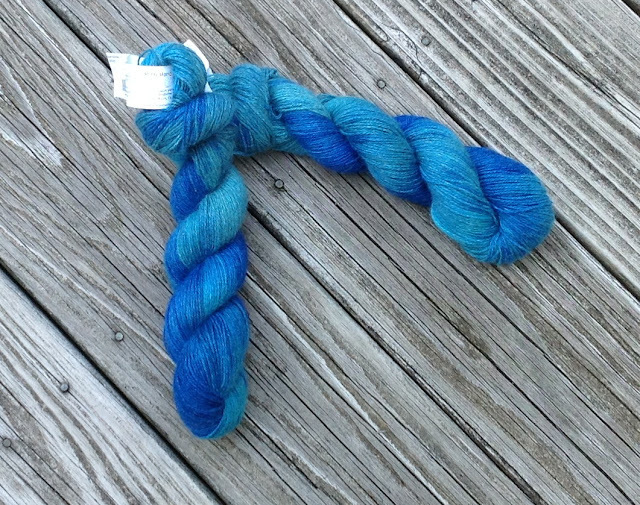 The yarn is 100% MINK. I was assured that the mink are not harmed but I didn't investigate too closely! All I can say is the yarn is luscious. 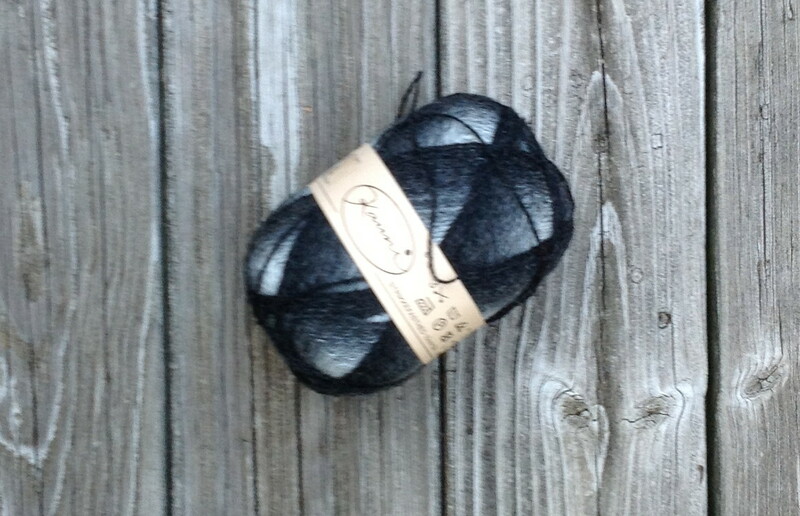 This yarn is for me but I think I want to do a twin set with it for the Spring Issue of Cast On. I have been meaning to get some Kauni to do a sideways garter skirt for me. I picked some up. 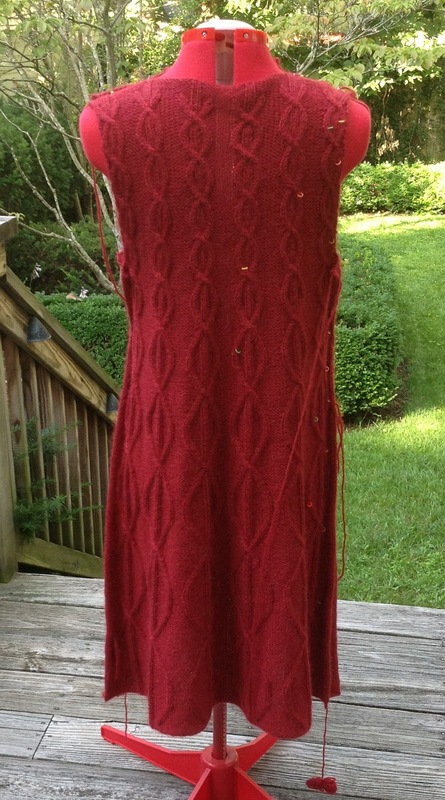 My skirt will have more short rows as I want it to flare more than the one I did for Cast On.